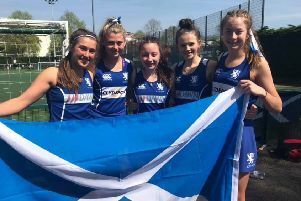 Borders athletes across a wide age spectrum contributed a marvellous series of displays during a weekend feast of competition, at home and in the city. Southern athletics clubs had representatives at the Emirates Arena in Glasgow for Scottish U20 and U15 Indoor Championships over last weekend. Local runners were also preparing for the Scottish Schools Athletics Championships at the Emirates as we went to press. Meanwhile, round six of the Borders XC took place at Minto Golf Club, while the Scottish Masters XC was at Stirches, both in Hawick. Each was extremely well supported, with Teviotdale Harriers heavily involved in organising both. The Masters’ men’s event consisted of a two-lap race over a hilly course. During the second lap Graeme Murdoch (Gala Harriers) moved into the lead and, coming into the final field, he was still leading, with Scott Brember (Central) close behind. But, over the final downhill sprint, Brember came through to become 2019 champion, closely followed by first M40 Murdoch . Other Borders successes included a men’s Age Category gold medal at M60 for Alastair Walker (Teviotdale). Thanks went to Teviotdale Harriers and all at Minto Estate for all the work involved in hosting the events, plus local farmer John Mercer for the use of his fields.